Preheat the oven to 190°C, gas mark 5. Place 4 essential Waitrose British Chicken Breast Fillets into a large baking dish with 6 unpeeled garlic cloves and 3 large sprigs thyme. Toss together with 1 tbsp rapeseed or olive oil and seasoning. 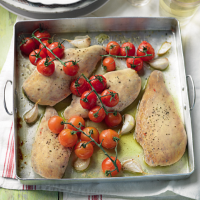 Bake in the oven for 15-20 minutes, then add 4 x 50-75g bunches cherry tomatoes on the vine and cook for a further 10 minutes, making sure the chicken is cooked through with no pink meat. Remove the garlic from the dish and roughly chop, discarding the skins. Warm 1 tbsp rapeseed or olive oil in a large pan. Add the chopped garlic and 300g finely shredded spring greens. Stir-fry for 3-5 minutes until wilted. Season and serve topped with the chicken, tomatoes, and any cooking juices. Great with new potatoes.